Omar Khayyam is one of the famous mathematicians and astronomers who was born in Persia (former name for Iran). He has made many notable contributions in Science (Mechanics), Astronomy, Etc. He is sometimes referred as the philosopher of the world, even though his philosophical teachings didn't receive much attention it deserved. He got much respect from the Western countries through Edward Fitzgerald, who translated much of his work into English. Many of his beautiful four line poems are translated into different languages and these poems were called as Rubaiyat. Ancient people were reservoirs of knowledge which they have shared for the future generations to comprehend and follow.He had made an awesome comment on life. He says that he made his soul travel to the other world to know about the life after death. At last, he came to realize that one's own soul is hell and heaven. The place where you dwell after death id determined by your own actions when you are alive. He advises us not to waste our time doing unwanted and undesirable things. The only thing over which you have control is today. Tomorrow is only a hope and not a promise that we will be happy. We never know what will happen tomorrow. 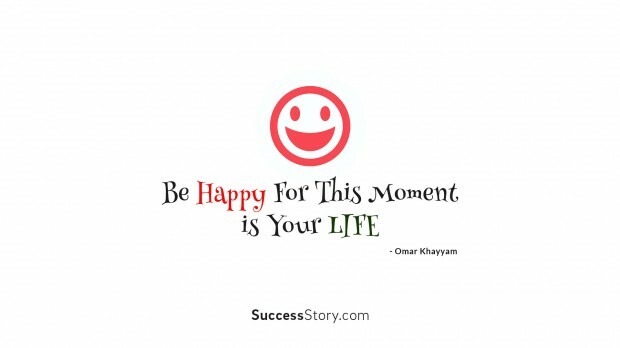 So live today happily and with contentment. As far as possible don't hurt others. Don't inflict your anger on anybody. If you want to reach the kingdom of God you have to feel the pain. It is always better to hurt yourself than to torment others. How true isn't it?